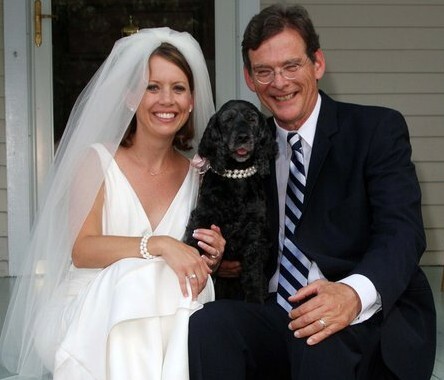 This Elizabeth Larson photo was made at our Greensboro, North Carolina, bungalow on September 25, 2010, our wedding day. My English cocker spaniel, Pinot Noir, wearing pearls, had waited for us to return from the church ceremony for our backyard reception. Less than two years’ time after, Pinot had given her heart to my wife Mary Leigh as completely as Mary Leigh had given hers to her. The two were inseparable. Acquaintances refused to believe Pinot had ever been my dog, though I had raised her from a puppy. But mine she had been, for eight years. She was quite the farm dog in those days. She spent most her time in summer neck deep in pond water and marsh grass, hunting the occasional frog or snake. In fall I kept her coat clipped close, for she was ever scampering through cockleburs and Spanish needles. She loved nothing better in winter than to wallow in snow, forming odd-shaped angels, until her coat and paws were a tangle of rattling ice balls. She happily became Mary Leigh’s diva. Lavished with attention and ease, she still tolerated my boisterous ministrations, but barely. She preferred trips to Mary Leigh’s hairdresser, where she sneered at the shop dog, a lowly Chihuahua. She slept in her place of honor on the desk pad alongside Mary Leigh’s computer. The balance of her hours she passed sprawled on Mary Leigh’s lap, demanding a tummy rub. That all ended April 6, 2017, when she passed away at the age of fifteen. Mary Leigh wrapped her in one of her favorite blankets when we picked her up at the vet’s, and held her in her arms as I drove home. She held her in a chair in the Florida room, carefully tucking the blanket around her as the sun set and tree frogs sang in the limbs of the pines and blue shadows crept through the palmettos of the back yard, until finally, all the warmth had left her small body. Only then did Mary Leigh allow me to bury her. When dogs die they take some of the joy in life along with them. But they aren’t greedy. They take just enough so whenever you think of them, you feel longing. This is true, even when I think of the farm dogs I had decades ago as a boy. But Pinot’s passing has been especially difficult. My wife’s anguish was so great I did not know if I could console her. But I was able to. And she consoled my grief. In her end, the little black dog who had once been mine made each of us stronger, and stronger together. Posted in Blog and tagged dog, dogs, English cocker spaniel. I am moved beyond words. What a lovely tribute! Thanks for sharing this with me. What an amazing expression of love for your best friend. Truly touched my heart. Thank you, Sally. Look forward to seeing you and Bill soon. Ross: this is such a wonderful essay. As you well know when you visited Pittsburgh last Fall during your Forsaken book tour — having endured the flatulence of Shannon, my black Lab, and the craziness of Cara, my yellow Lab — we are dog people. You poignantly captured what one endures with the loss of a beloved pet. I remember you telling me about the story about the time you lost Nimrod. Please accept our condolences. Thank you, Chris and Jane. Much appreciated. And best to Shannon and Cara.